The town of Puerto Viejo is 20 minutes drive south of Cahuita and is a vibrant beach town with many restaurants, bars, shopping and hotels. In the sodas (pubs) it smells of curry and "rice & beans", a delicious coconut bean rice dish. Men and women of all colors, with their colorful, hair-elongating pigtails or rasta hair ride on bicycles through the streets. In the evening, loud reggae drones music from the bars. Life in Puerto Viejo is colorful and multicultural. The coastal road continues south from Puerto Viejo, along the coastal road, past the long-running beaches of Playa Cocles, Playa Chiquita, Punta Uva and on to Playa Manzanillo. Where you will find the wildlife sanctuary Gandocca Manzanillo, which extends as far as Sixaola, the border with Panama, only a 50-minute drive away. The beaches in Cocles and Playa Chiquita are ideal for surfing. If the current decreases, you can bathe well between the coral benches. 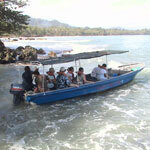 The public beach of Cocles is 1.5 km north of Puerto Viejo and stretches over a length of two kilometers. It is a well known Surfing beach, and although, as in every beach, precautions should be taken, especially when the tide is decreasing, there is a Lifeguard Tower at the beginning of the Playa Cocles, on which day lifeguards pay attention to the safety of the bathers. The lifeguards also provide information about where bathing is currently dangerous and where you can swim easily. The light gray sandy beach turns north into Playa Chiquita. Playa Cocles is ideal for those who like long beach walks or jogging on the beach in the morning. 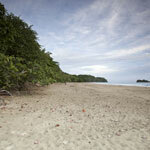 You can comfortably walk from Playa Cocles on the beach in a northerly direction about 15-20 minutes to Puerto Viejo. Or you can stroll south and explore the neighboring beaches of Playa Chiquita and Punta Uva.